Sodium Hyaluronate is a product based on a class of products known as hyaluronic acid, sodium hyaluronate, or hyaluronans.1 It is approved for the treatment of pain due to osteoarthritis of the knee in patients who do not get adequate relief from simple painkillers or from exercise and physical therapy. How is Sodium Hyaluronate administered? 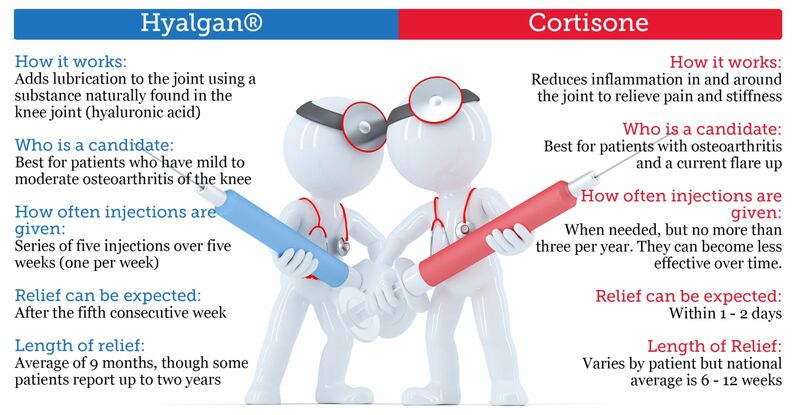 Sodium Hyaluronate is administered by your health care provider as an intra-articular injection into the knee joint. Why is my doctor recommending I receive Sodium Hyaluronate? Sodium Hyaluronate is indicated for patients with osteoarthritis knee pain who do not obtain adequate relief from simple painkillers, or from exercise and physical therapy.2 Ask your doctor for additional information and discuss your treatment options. Is Sodium Hyaluronate approved for use in the U.S.? What is Sodium Hyaluronate made from? Hyaluronic acid is naturally present in the body and its composition is almost exactly the same in all animal species – including human. It is particularly in high amounts in joint tissues and in the fluid that fills the knee joint (synovial fluid).1,3 Sodium Hyaluronate is made from an extraction and purification of hyaluronic acid from rooster combs, where it is also found in particularly high amounts. Will my insurance cover Sodium Hyaluronate? Most insurance carriers and Medicare cover Sodium Hyaluronate. The process of obtaining reimbursement varies from plan to plan so talk with your doctor’s office and your insurance provider before you begin treatment to find out if Sodium Hyaluronate is covered. 1Why are three or more injections required? Clinical investigations with Sodium Hyaluronate have demonstrated that three*5 to five6 injections one week apart provide significant pain relief and restoration of joint mobility. Completion of the full injection treatment course is recommended to achieve the greatest therapeutic benefit. 2How do I know if Sodium Hyaluronate is right for me? A doctor is the best person to advise you on any course of treatment. Sodium Hyaluronate is approved for the treatment of pain due to osteoarthritis of the knee in patients who do not get adequate relief from simple painkillers or from exercise and physical therapy. 3Am I too old for Sodium Hyaluronate injections? There are no specific precautions or contraindications regarding the use of Sodium Hyaluronate in older patients. During clinical trials, the safety profile of Sodium Hyaluronate was well established in older patients (greater than 50 years old). 4Can I take other medications with Sodium Hyaluronate? Because Sodium Hyaluronate is injected directly into the joint and not administered systemically and there are no known drug interactions,8 you may be able to take other medications as well. It is not known to interfere with other pain relievers and anti-inflammatory drugs. The safety and effectiveness of the use of Sodium Hyaluronate concomitantly with other intra-articular injections, such as steroids, have not been established. You should discuss all of your current medications and vitamin supplements with your physician on a periodic basis. 5Can I receive Sodium Hyaluronate in both knees? Yes, if both knees have pain. Sodium Hyaluronate treatment may be given in both knees simultaneously or separately, according to your physician’s recommendations. Because Sodium Hyaluronate is only injected locally into the knee joint and not administered systemically, it is not likely that injections into one knee will have an effect on both knees. Please consult with your physician on his/her recommendation. 6Should I avoid strenuous activities after receiving Sodium Hyaluronate treatment? It is recommended that you avoid strenuous activities such as jogging, tennis, and heavy lifting or standing on your feet for a long time for at least 48 hours after receiving an injection.2 Your doctor will advise about what level of activity is right for you, but in general, patients are able to maintain their normal daily activities after receiving Sodium Hyaluronate treatment. 7How often can Sodium Hyaluronate be injected into my knee? The number of courses/injections is a decision you and your doctor need to make. Your doctor may recommend three* or five Sodium Hyaluronate injections and repeat treatment based upon their clinical assessment and discussions with you. Studies show that retreatment with Sodium Hyaluronate is safe following the initial treatment period.2,7 Some insurance plans restrict the frequency at which you can receive additional injections. Consult your doctor’s office or insurance provider to find out about coverage for any retreatments you may receive. 8Can Sodium Hyaluronate be used in joints other than the knee? The U.S. Food and Drug Administration has only approved Sodium Hyaluronate for use in the treatment of OA of the knee.2 The FDA has not approved or made an evaluation regarding the safety and effectiveness in other joints. 9Can Sodium Hyaluronate alleviate the signs and symptoms of osteoarthritis of the knee? There is no cure for osteoarthritis. Sodium Hyaluronate is a treatment for the symptoms of knee pain in osteoarthritis, with long-lasting benefit. 10When can I expect to experience pain relief? Each patient’s response to Sodium Hyaluronate may vary, depending on severity of your OA, degree of pain, and pre-existing medical conditions. In some patients, successful treatment may reduce pain within the first week after treatment begins. However, based upon clinical trials, patients may experience pain relief after their third injection of Sodium Hyaluronate. 11Is Sodium Hyaluronate treatment effective in knees with advanced osteoarthritis and loss of cartilage? Clinical studies with Sodium Hyaluronate have been primarily done in patients with mild to moderate OA. 12What are the benefits of receiving Sodium Hyaluronate treatment? Successful treatment with Sodium Hyaluronate should reduce pain in an osteoarthritic knee, resulting in increased mobility and recovery of joint function.6 Because it is a local treatment, Sodium Hyaluronate should not interfere with any concomitant medicine that the patient may take. Please seek advice from your physician. 13How long can I expect the benefits of Sodium Hyaluronate to last? Each patient reacts differently to Sodium Hyaluronate treatment. Five injections given at weekly intervals can provide most patients with long-lasting pain relief for up to 6 months. The duration of pain relief you experience may vary. Some patients may experience benefit with three injections given at weekly intervals. * This has been noted in published literature of patients receiving three injections who were followed for 60 days. 14How safe is Sodium Hyaluronate? Extensive safety and toxicity tests were performed on Sodium Hyaluronate before the first clinical trials. Sodium Hyaluronate has been in use since 1987 in Europe and 1997 in the U.S., with 50 million injections given worldwide since launch.4 In clinical trials, transient local pain or swelling occurred with some patients with injections of Sodium Hyaluronate. 15What are the side effects of Sodium Hyaluronate? Because Sodium Hyaluronate is injected directly into the joint, some patients may feel localized discomfort after treatment.2,6,8 Transient pain, swelling, and effusion may occur in and around the knee, which usually go away within a short period and do not interfere with the success of the treatment. If you continue to feel discomfort or notice other problems, you should consult your physician. 16Are there any allergies that may affect Sodium Hyaluronate treatment? Consult with your doctor if you have a history of allergy, especially if you have had a reaction to intra-articular hyaluronic acid preparations or are allergic to avian proteins, feathers, and egg products. There are rare reports of patients reporting allergic reactions to Sodium Hyaluronate injections.2 * Some patients may experience benefits with 3 injections, 1 injection per week for 3 weeks. To learn more about Sodium Hyaluronate can help you, call us at (708) 385-4416 and schedule an appointment today.